I'm really just a bit of a nerd. I spend most of my time doing new stuff on the web. Mostly front end, but I do dabble in a bit of back end. When I run out of stuff on the web, I often end up staying up late with Netflix. We've all been through those days. All that said, feel free to check out some more of my stuff. Did you not see the icon? Seriously... Just scroll your mouse down! I'll just do it for you. I should probably revert this just in case you come back..
👋 Welcome to my website! 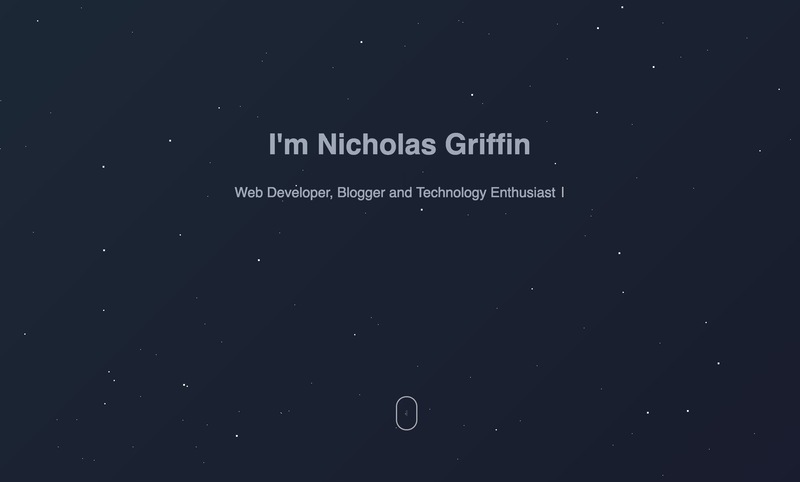 As you might have read in the title, my name is Nicholas Griffin and I am a web developer, blogger and technology enthusiast from the UK. I spend most of my time doing a range of personal web development projects around the web alongside my work for Accrosoft, where I work as a developer and deliver a range of web-based projects for our customers around the globe. I aim to use this website to not only showcase myself but also start working on a range of other personal projects. You can follow my expeditions below. Below you will find some of the blog posts that I have wrote (if that is still working), I used to write a lot and I'm looking to write blog posts more about the projects that I am working on. There might not be a lot here but I hope that it will at least be interesting, at least to me.